Improve your parts cleaning with a High Pressure Spray Washer | Ketcham & Company, Inc. There are significant benefits to integrating a high pressure cabinet spray washer into your parts manufacturing process. You can achieve consistently clean parts at potentially higher cleanliness levels economically, efficiently and at a reasonable investment level. What is a high pressure spray washer? 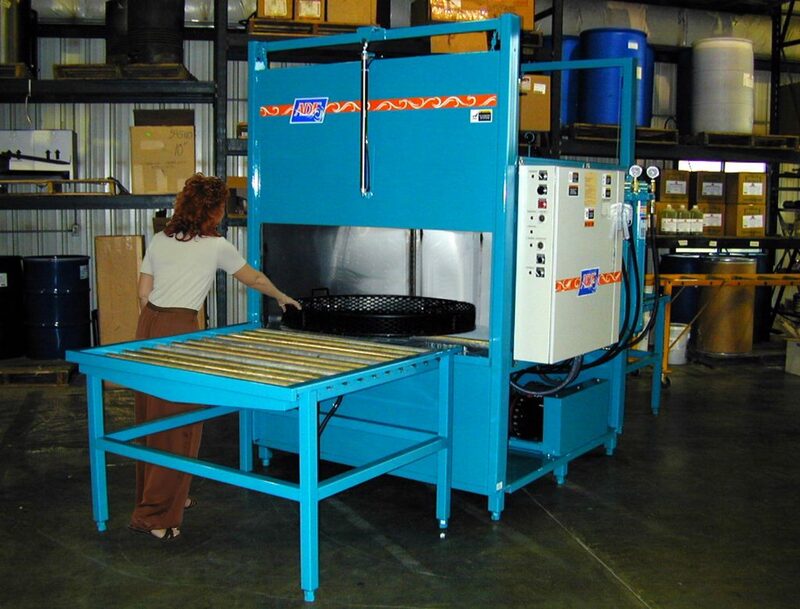 Most common cabinet style spray washers in use today are low pressure/high volume systems. Spray pressures in these washers tend to operate in the area of 40-65 PSI while pumping the cleaning solution at a volume of 50-100 GPM. This results in system that utilizes a high volume of cleaning solution flooding the parts at a relatively low pressure to achieve cleaning. This type of system has its applications and they tend to be cleaning heavily soiled parts that are contaminated with gross contamination. These systems are very effective in removing large amounts of heavy oils, waxes, carbonized greases and large particles. The main advantage of a low pressure/high volume system is that heavily soiled parts such as those found in engine overhaul facilities and maintenance areas can be adequately cleaned in a single washing cycle. The big disadvantage with these systems is that small particles, non-soluble residues, blind holes, and crevasses tend to be difficult to clean especially when combined with the high surface tension of water. 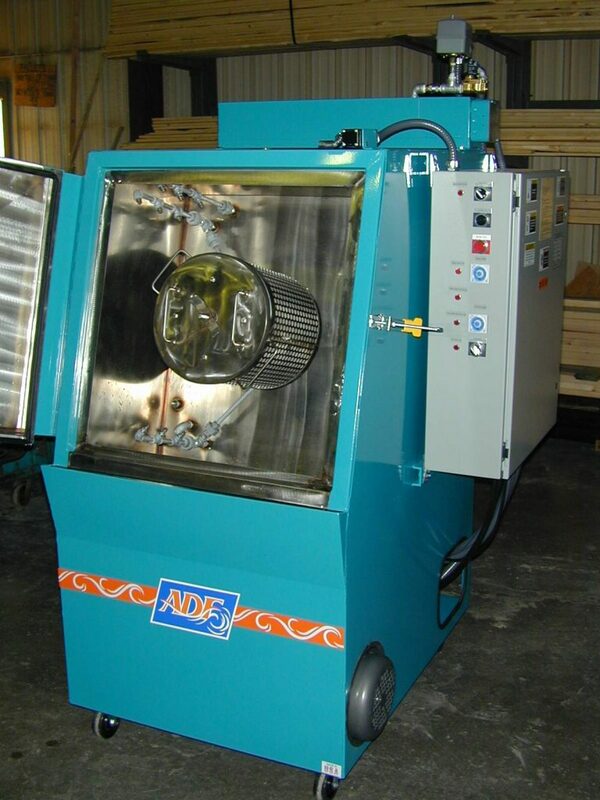 ADF Model 710 High Pressure Tumbler Washer is ideal for cleaning small parts from swiss screw machines. The gentle rotation and high pressure sprays combine for excellent cleaning. Spraying with liquid Solvent, 5‐30 sec. The result is that high levels of cleanliness are difficult if not impossible to achieve with a low pressure system. The low pressure/high volume system is fine when properly used for the correct application. However, if high levels of cleanliness are the desired results in more critical applications such as small precision screw machine parts or medical devices, these systems are not the optimal choice. The results change significantly however in a high pressure/low volume cleaning system. When a high pressure (500-750psi) system is employed, small particles, insoluble soils, small chips and blind holes are more readily cleaned to desired levels. The chart, figure 1, (from “Techniques for Removing Contaminants from Optical Surfaces” by Stowers and Patton) quantifies the improvements for particle removal obtained by using high pressure spray. Notice that there is a significant improvement in cleanliness obtained by the use of high pressure spray equipment. This is in part due to the increased impingement that occurs in these systems. This increased impingement will also aid in the removal of difficult soils such as non-soluble residues, hardened oils, waxes and particulate. In addition, with the proper positioning of the spray nozzles we can clean blind holes and difficult crevices much more effectively than conventional low pressure systems. ADF Model 900 Pass Through Washer-Ideal for larger parts. Available in several sizes and can be configured in wash, rinse and wash, rinse and blow off. Cleaner Complex Part, Blind Holes etc. As with any cleaning system the proper chemistry will make a significant difference in the cleanliness of the completed parts. Therefore, process evaluation should consider the desired cleanliness levels required of the finished product, substrate material, soils being removed and the appropriate cleaning solution should then be carefully selected. ADF Model 800 top opening high pressure washer offers excellent value. 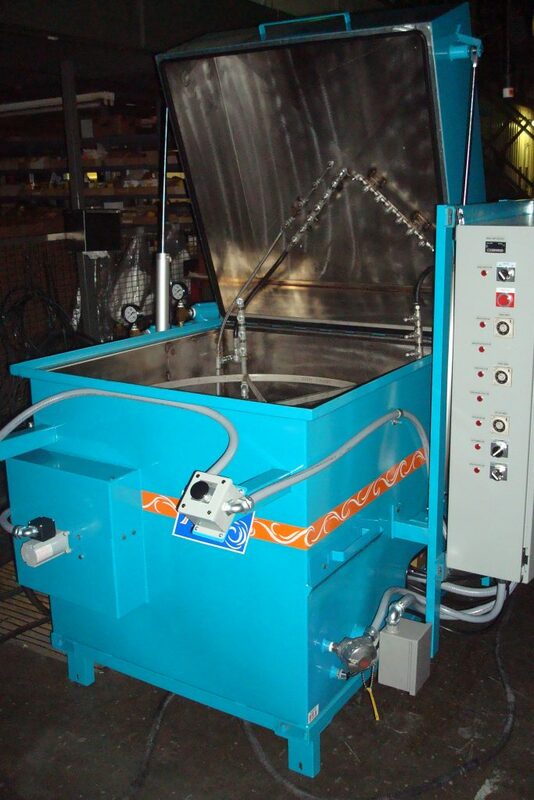 It can be configured as a wash, wash/rinse, or wash/rinse/blow off system. The parts are loaded and the operator pushes the cycle start button initiating the cleaning process. At the end of the cycle the parts are removed. Obviously, one of the major differences between high and low pressure systems is in the pump used in the design of the equipment. Low pressure systems generally use a centrifugal pump which produces 50 –75 PSI nozzle pressures at a flow rate of about 50-100 GPM depending on the size of the system. If the pressure is increased, the flow rate will decline. Cleaning depends on large volumes of solution flowing over the parts producing a flooding action and flushing the parts clean. High pressure systems on the other hand, use a positive displacement pump which produces 500-750 PSI nozzle pressure at 7-20 GPM resulting in a high pressure spray through multiple nozzles at a relatively low flow rate. The control of the pressure and flow rate is determined by the nozzles and pump specification. Additionally, these systems are designed with a multiple nozzle spray manifold plus part rotation. When this is combined with high pressure spray technology cleaning is greatly improved by the tremendous sprays which result from the 750 PSI spray pressures. Because of their smaller reservoirs, high pressure cabinet spray washers use much less cleaning chemistry that their low pressure counterpart. The smaller reservoir is easier to filter and keep clean extending the life of the solution. It also requires significantly less energy as it takes much less heat to start up and maintain the solution temperature. These systems are available in a variety of sizes and configurations. Contact us for an applications analysis or to answer any questions you may have.